There is no one-to-one translation of what a malmgård is, so I’m going to do my best to describe the phenomenon succinctly. Most easily translated is the second half of the word, gård, which directly translates to farm. Malm is a little more amorphous—directly translated it means “ore” as in “iron ore.” In the context of Stockholm where the geography is peppered with giant granite bulbs rising out of the water, malm connotes a high, rocky place. 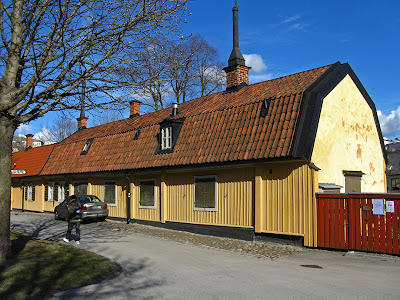 Over time it also began to mean “suburb” or “area.” First there was Norrmalm, or Northern Suburb, on the mainland just north of Gamla Stan (Stockholm’s Old Town). 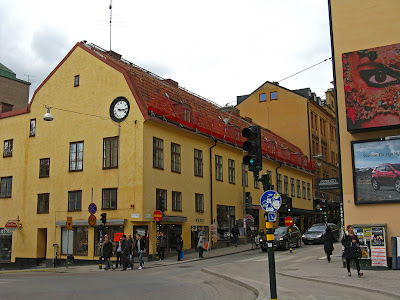 Soon thereafter came Södermalm, or Southern Suburb, on the island just to the south of Gamla Stan. Much later Östermalm, or Eastern Suburb, was founded to the east of Norrmalm. A malmgård, then, is a farm in suburban Stockholm. 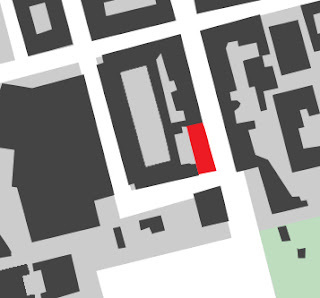 These farms were on the very fringes of town, just to the north in Norrmalm and Östermalm, just to the south on Södermalm, and just to the west on Kungsholmen. They were so close to the city that some owners commuted into town daily. While I’m sure that some goods were sold for economic benefit, these farms were generally just large enough to provide food and goods for the owner’s family’s needs. On the malmgårdar (plural for malmgård), there was room for everything that was needed to support a family but that didn’t fit on a city plot: sheds for the slaughter, salting, and smoking of meat; a mill, a bakery, a brewery, and laundry facilities; extensive kitchen gardens with herbs, vegetables, and medicinal herbs; fields of tobacco, wheat and other grains; flower gardens to provide cut flowers; tobacco drying barns and numerous storage sheds and root cellars; fruit orchards and berry bushes; a pond for cultivating fish; and barns and feed storage for a limited number of livestock and horses. In addition to the “practical” agricultural functions above, many malmgårdar also featured extensive greenhouses and orangeries for the cultivation of exotic plants including orange trees, lemon trees, Seville oranges, aloe, ficus, lavender, fig trees, oleander, rosemary, olive trees, mulberry trees, nutmeg, boxwoods, laurel trees, myrtles, roses, carnations, and cloves. While these malmgårdar were places of agriculture, they were more than just a farm. They were also summer homes: nice, country places with fresh air, perfect for enjoying the summer with family and guests. Many were adjacent to water or to high, breezy hills. Commonly there was a glassed-in gazebo or pleasure house on the grounds. It is probably this second function of enjoyment that enticed owners to preserve these places in the face of advancing development. The line between a Malmgård and a Palace is at times quite thin and grey. Some of the buildings below such as #16 Kristineberg's and #22 Hellsten's/Wirwach's are grandiose enough and “designed” enough to look like the palaces in my Palaces of the 1600’s post. However, many of the malmgårdar are very modest in scale and were built with traditional materials and methods such as #1 Triewald’s and #11 Hedberg’s. Even the most grandiose of malmgårdar were generally owned by buisinessmen and politicians instead of the nobility. While owning a suburban farm/summer home was out of reach of most Stockholmers, one did not need to be a count in order to afford one. A list of occupations of the founding owners include mayor, postmaster general, garden master, architect, officer, distiller, cabinet minister, foreman, councilman, wagon maker, businessman, tanner, apothecary, dyer, textile factory owner, wholesaler, and governor. Nineteen of the buildings below were designed by an unknown person; a specific architect is known to have designed the other eight residences. Generally, the buildings with an unknown architect are quite simple and modest, and they are built with traditional materials (wood timbers) and methods (log cabin). Decoration and detail in these buildings are limited to doorways and they have high gable or gambrel roofs. The architect-designed buildings tend to be larger, more grandiose, built of stone and plaster, have shallower hip roofs, and are brimming with classical elements and details. 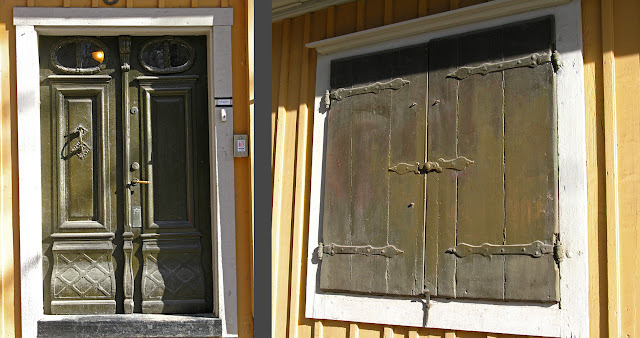 It is probably no coincidence that the simple, vernacular wood malmgårdar are weighted toward the 1600’s while the larger, architect-designed stone malmgårdar are weighted toward the end of the 1700’s. The contrast between Ekerman's and Heleneborg demonstrates the contrast between a vernacular and an architect-designed malmgård. In the late 1700’s, awkwardly proportioned colonnades make an appearance in several buildings, both architect-designed and with unknown architects. 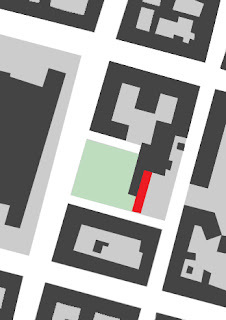 Both Patton's and Reimer's malmgårdar have awkward, squat colonnades. Larger complexes continue the palace tradition of three buildings forming a “U” around a central courtyard. 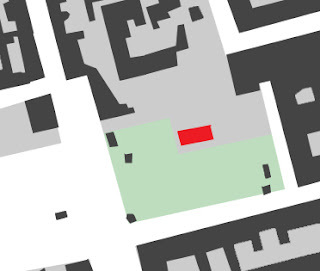 Hellsten's/Wirwach's and Kristinahov's have typical courtyards. Even for the grandest of buildings, symmetry was not necessarily demanded by the architect or owner. The more practical arrangement of doors and windows reminds me of George Washington's Mount Vernon which was built around 1765. It wasn't until a little later that strict symmetry regardless of functionality was inherent to a grandiose building. Mount Vernon and Björn's both have asymmetrical openings. I find it interesting that of the nine malmgårdar immediately adjacent to the water, only two have front doors facing the water. 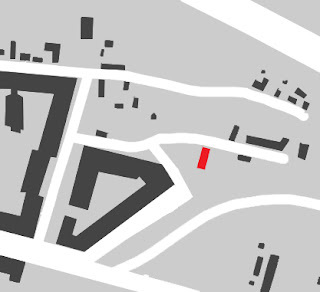 I do not know the official reason for this but suspect that the main access for most of these houses was directly from the city and thus from the land side of the houses. The houses were close-enough to the city that a horse was a more convenient form of transportation to and from town than a boat. The only malmgård for which I found a reference to a boat dock is #16 Kristineberg, which was by far the furthest out and most rural of the malmgårdar. 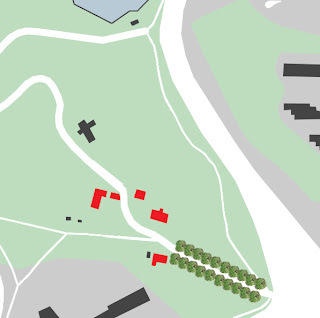 While these summer houses and suburban farms provide an interesting, juxtaposing glimpse of rural life within a bustling city, it is not the buildings or farms themselves that I find significant within the context of Stockholm’s urban planning. Instead, it is the fact that these rural havens survived urbanization long enough to make a lasting and discernible impact on Stockholm’s development. Nearly every single one of these 27 summer houses/suburban farms is at the edge of what is now a green area within the city. These parklands were once the farming fields, wooded glades, and grazing pastures that belonged to the houses. Because the subsequent owners were able to hold onto their houses and land while the surrounding areas became more and more urbanized, these undeveloped lands became pockets of greenery within an ever-more hardscaped Stockholm. When these farms and summer houses were later faced with demolition and development, concerned citizens and planners were able to preserve significant parts of the surrounding landscapes as parks and/or schoolyards. Several of these surviving summer houses/suburban farms were located on the edges of steep granite embankments and were therefore probably saved from development due to more practical reasons. These include #14 Schinkel’s and #21 Paton’s. A few others including #2 Pauli’s and #13 Nederland’s have been completely swallowed up and surrounded by urban development. These once-country houses are now seamlessly integrated into the urban townscape and unless one looks more closely, they seem to have always been amidst an urban environment. Pauli's and Nederland's are atypcial malmgårdar because they have been swallowed up by the surrounding developement. 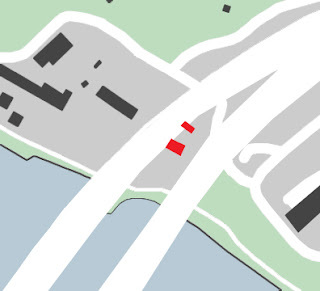 I do not think it is coincidence that 17 of the 27 suburban farms still surviving today are on Södermalm. Although this island is incredibly close to downtown, it was traditionally the undesirable part of town. Pressure to develop this island has always been less than the pressure to develop Norrmalm, allowing more of Södermalm’s rural character to stay intact. 1) Triewald's, mid 1600’s. Kungsholmen. Architect: unknown. Owned by a knighted mayor in the mid- 1600's. 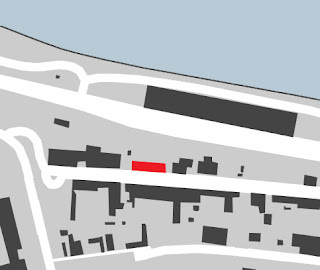 Like most malmgårdar, the exact origins of this farm and summer house are unclear, but we know that it existed at least as far back as the mid-1600's. The building's scale and form seem fairly typical. Although it looks modest to us today, this log cabin house would have been mansion-like in the suburbs of Stockholm in the 1600's. It is interesting to note that there is no door facing the water even though the house is sited right at the water's edge. Like most log cabins in Sweden, the raw timbers have since been covered with wood siding in order to protect them from further damage from the elements. Even though the timbers are covered, one can still clearly see that the house is log-cabin construction because the timbers project past the face of the wood siding. 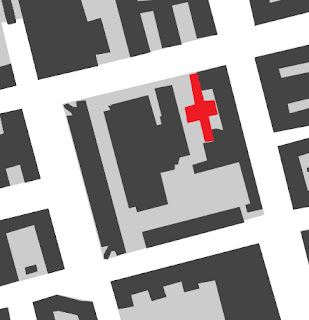 These projections are covered in white trim--a simple rectangular projection where interior walls meet the exterior walls in the middle of the building, and a half-x shape at the corners of the building. 2) Pauli's, 1654. Södermalm. Architect: unknown. 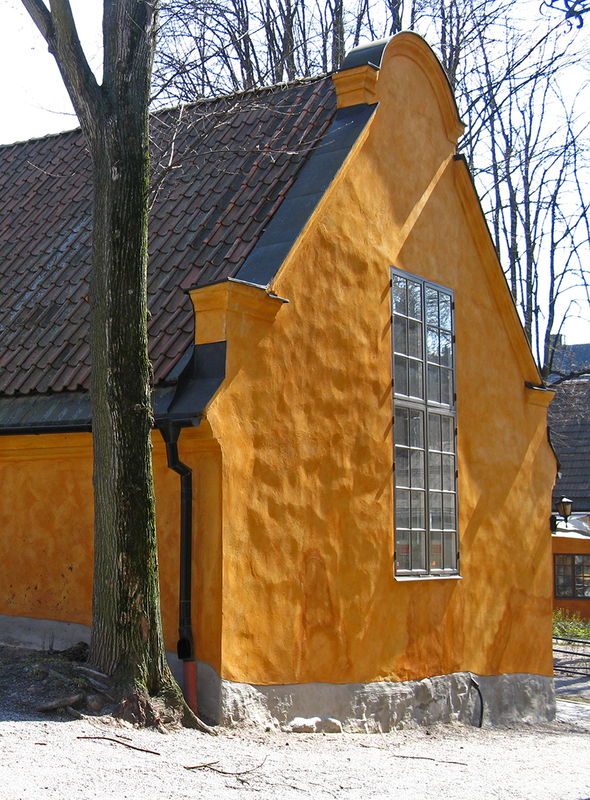 Built by Sweden's Postmaster General and a member of the king's court's council. Although this house has been truncated and is now integrated into the urban fabric, traces of its former grandeur are still obvious due to its size and massing. This brick summer house is more palace than modest farm house and at one time even had a terraced park leading down to a now-vanished lake. 3) Groen's, 1670. Södermalm. Architect: unknown. Built by the Dutch garden master Christian Hårleman who converted Kungsträdgården from a kitchen garden to a royal park. Although it's hard to get a good view of the building, it looks like it hasn't changed much since Ehrenfried Wahlqvist's 1887 painting of the malmgård. The king wasn't so diligent in paying Hårleman for his work, so the garden master was forced to buy land and start a farm to support himself. Hårleman planted 286 fruit trees and grew grapes, Seville oranges, lemons, and melons (and probably more) in a series of terraced gardens, greenhouses, and orangeries. Today, this land still produces biodynamic vegetables and there is a seasonal cafe. 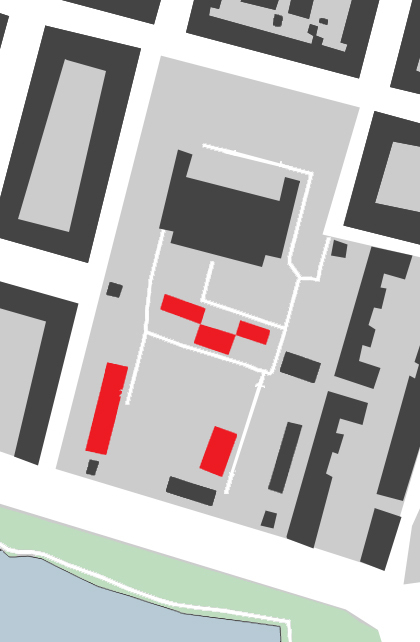 Together with an extensive fence, two of the out-buildings still frame the property. Like many of the surviving malmgårdar, Groen's is situated at the base of a steep, knobby granite hill. This hill area is now a large park. 4) Heleneborg, 1672. Södermalm. Architect: Johan tobias Albinus. Built for Österling who had fought in Germany, Poland, and Denmark for the king. 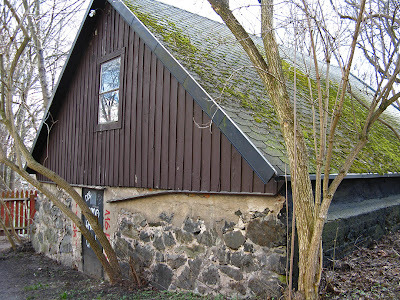 The history of this malmgård at the base of a hill fronting the canal between Södermalm and Långholmen is well documented. Originally, the grand main building was flanked by two one-story wings and there were also many other buildings on the property including a horse stall, a windmill, a blacksmith operation, and several farm/storage/work buildings. The architect also designed a noteworthy garden. Surely the farm produced other goods as well, but its tobacco and six carp ponds with 800 fish were well known. Like the less grand Triewald malmgård (#1), the front door faces the hill instead of the water. 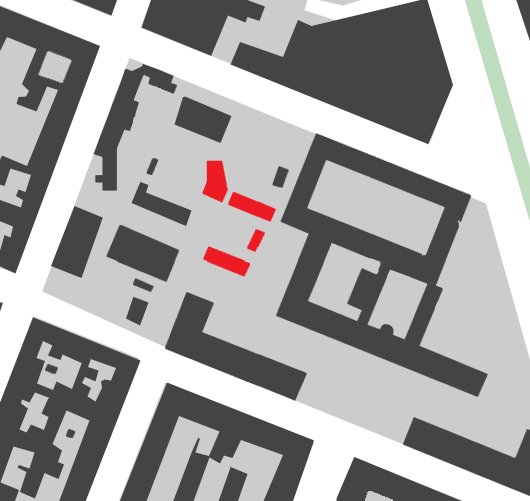 Today the main building is privately occupied and it is awkwardly smooshed between two roads. 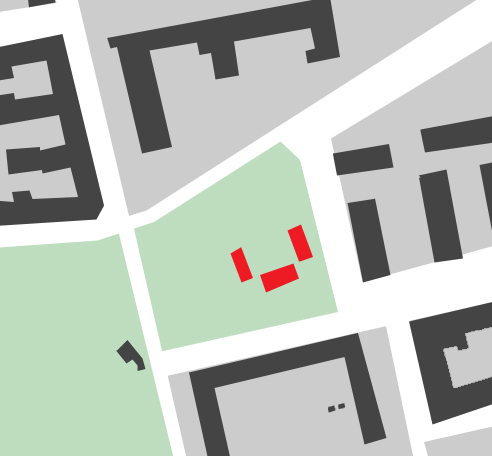 The strip between the main road and the canal remains a park, but it is hard to sense that the area was once spacious and sparsely populated. and this facade faces the interior of the island and a hill. 5) Ersta, end of 1600’s. Södermalm. Architect: unknown. Owned in 1676 by a snaps distiller. All that remains of this malmgård is the gate and two large gate houses. Originally there was also a main house, a horse barn, a feed storage building, a storage building, and an orangerie as well as a farm and garden. The malmgård sits high on a cliff edge overlooking the main Stockholm harbor. 6) Piper's Muren, end of 1600’s. Kungsholmen. Architect: unknown. Built by Carl Piper, a minister in the King's cabinet. This wooden summer house was built to accompany an existing garden, and the new owner "immediately got to work bettering the garden with its plantings, allés, grottoes, busts, orangerie, and greenhouse." A curved garden wall with statuary-filled niches still buffers the front of the building from the city while the back garden forms a green pocket in the dense cityscape. The building is now used as a conference center but the gardens and garden cafe are publicly accessible. To the left: a copperplate showing the garden in the late 1600's and to the right: the simplified garden today. 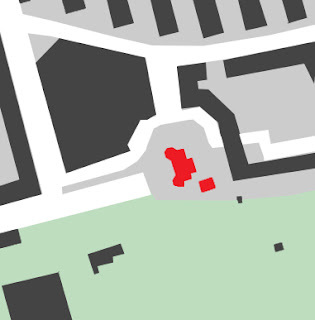 It looks like the main building was once two buildings that were later connected together under a simplified roof. I thought this wooden garden balustrade was interesting in that it imitates forms usually carved from stone. 7) Cedersdal, beginning of the 1700’s. Norrmalm. Architect: unknown. Original owner also unknown. 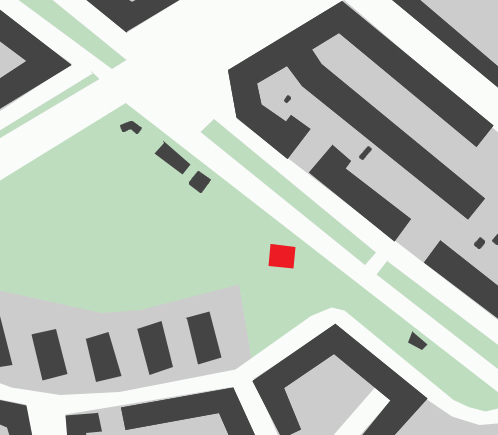 Cedersdal is a modest malmgård at the base of a high, steep hill that is now a large public park. Most of the original farm buildings no longer exist, but a tobacco-drying barn still stands. 8) Molitor's, beginning of the 1700’s. Södermalm. Architect: unknown. Built by Christian Molitor, an apothecary. This simple summer house at the water's edge was built by a German apothecary. The house was surrounded by medicinal gardens which provided the raw materials for the apothecary's potions that he sold in an apothecary shop in town. Today the malmgård sits at the edge of a very large park and the buildings house two private households. Sadly for the historic buildings, the original road to town now crosses the water on two high bridges which tower above the buildings. 9) Oxenstiern's, 1710’s. Östermalm. Architect: unknown. Built by Count Gabriel Oxenstierna. The north, east, and south wings form a "U" around the central courtyard. This farm remained intact with several miscellaneous barns, a kitchen, a brewery, a horse barn, a "beast" barn, a pigsty, a wagon garage, and a mill for quite a long time until the state bought the land and built the royal stable there. 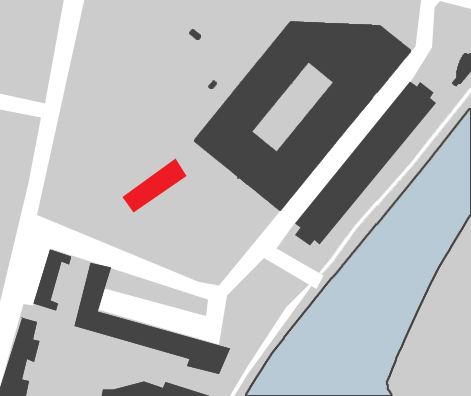 Today the three wings house offices and a cafe while the History Musuem now occupies the stable and military buildings on this large block. Although these buildings are quite simple and fairly small, they are built of expensive stone and the Renaissance forms at the gable ends provide elegant relief to the uniform facades. 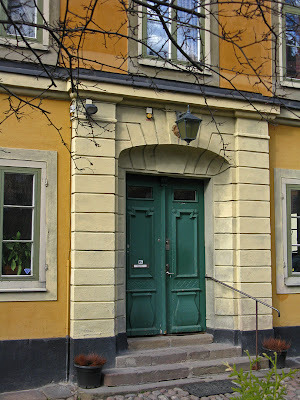 10) Hårleman's 1710. Norrmalm. Architect: original architect unknown. Renovated 1748 by architect Carl Hårleman. Renovated again 1901 by architect Wilhelm Klemming. Originally built by the widow of the garden master Johan Hårleman (who also owned/built Groen's, see #3). I suppose that the Hårlemans' luck must have turned by the time Johan's widow built this grand summer house. 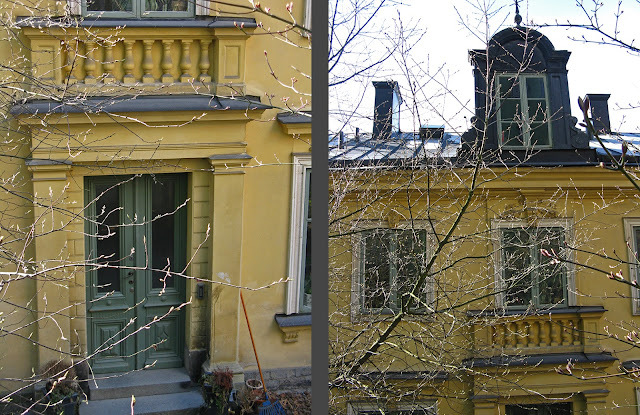 Their older summer house was just south of town on Södermalm, but this one is just north of town in Norrmalm. 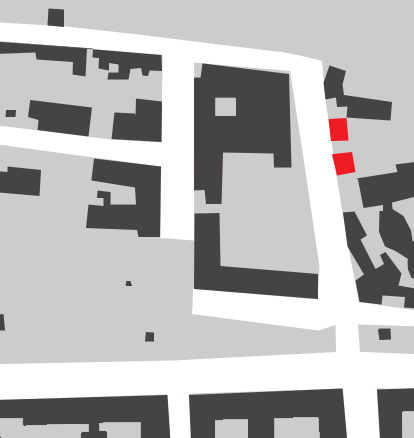 Today, shops occupy the street level and private residences are upstairs. 11) Hedberg's, 1711. Södermalm. Architect: unknown. Built by Hans Westman, a foreman. All of the accompanying out buildings survived until the 1950's, but today, only the modest wooden main residence remains of this once extensive farm. That the main building survives at all is probably due to the fact that this area was once highly unpopular and housed only the poorest of Stockholm's poor industrial laborers. Today, the building is a rural idyll amidst urban Stockholm. A private household now occupies the building. 12) Stora Blecktornet, early 1700’s. Södermalm. Origianl architect and architect of the 1777 and 1856 additions/renovations: unknown. Original owner unknown. 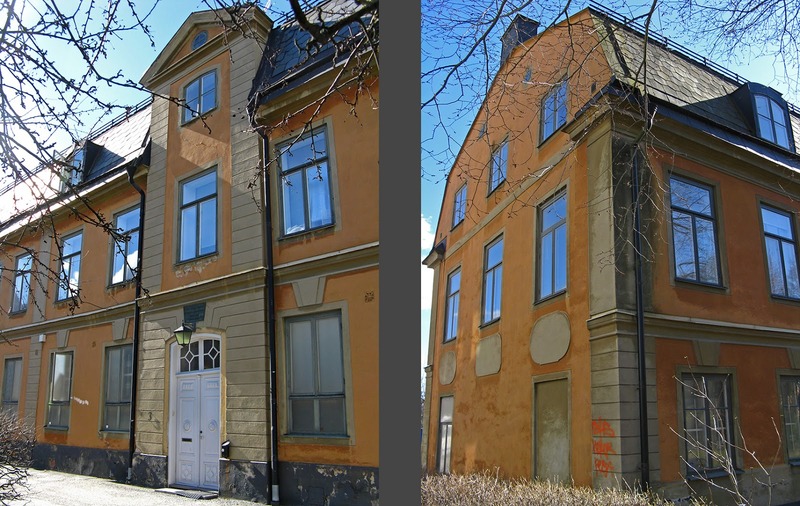 Owner at the time of the 1856 additions/renovation was Christoffer Hederström who was a councilman in the Court of Appeals. An eight-sided tower along with a modest residence and several farm buildings occupied this site at the top of a steep embankment since the early 1700's. It is not clear what purpose the tower originally served. In 1777, the barn was rebuilt to become a summer/farm house, but this house clearly wasn't up to standard as a new owner tore down that house and built a new, grander house which connected to the original tower. A second, new tower was built to symmetrically frame the house. Both facades of this 1856 building are impressive. Most of the farm buildings have disappeared over time, but this root cellar still stands. Today, the house stands at the edge of a large park which lies just below the embankment. The building is now used as offices. 13) Nederlands, 1737. Södermalm. Architect: unknown. Built by a wagon maker named Pfeiff. Today, this large, stone summer/farm house is completely absorbed into the urban fabric. Until one looks closely and notices the decidedly older roof form, the building seems to be a part of the development which took place in the area in the late 1800's and early 1900's. 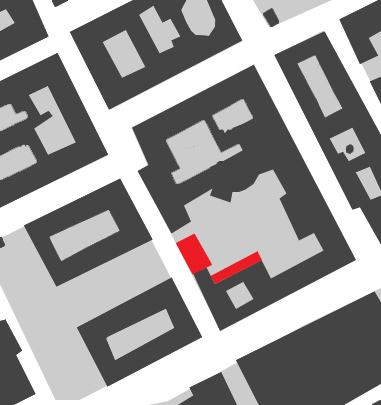 Restaurants and stores occupy the street level and private apartments occupy the two floors above. 14) Schinkel's, 1738. Södermalm. Architect: unknown. Built by businessman and politician Johan In de Betou. This rather large stone house is flanked by two one-story wings. 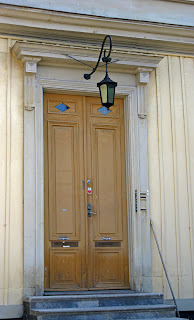 A Gustavian gate allows access from the street to the narrow strip of land behind the house. The house sits atop a high, steep cliff overlooking Stockholm's harbor. This precarious position probably prevented denser development from destroying the area. 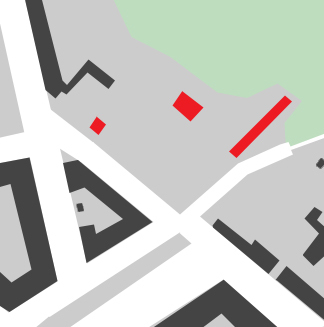 Today the house is divided into several private apartments. 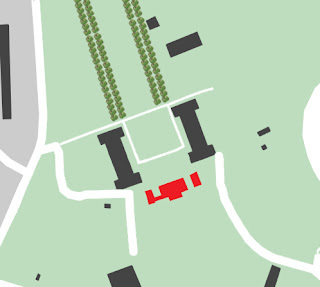 Even though the property wasn't big enough to be a full self-supporting farm, Schinkel's malmgård is a good example of how these houses fulfilled both pleasure and business functions. Up on the cliff overlooking the water was a glassed-in gazebo for parties and meals, but on the banks of the water at the bottom of the cliff, Betou owned a salt operation and salt storage sheds. A steep staircase connected the salt operation to the house. 15) Ekerman's, 1600’s/1740. Södermalm. Architect: unknown. 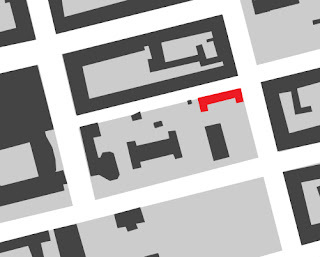 Several existing buildings from the 1600's combined into one building around 1740 by a Mayor and businessman. This modest summer house consists of several log cabins on stone foundations that were combined under one long roof to create an elegant if simple summer house at the owner's country farm. We know that around 1813, the farm at least grew tobacco, had 100 fruit trees and 200 berry bushes, and had a greenhouse with hotbeds. 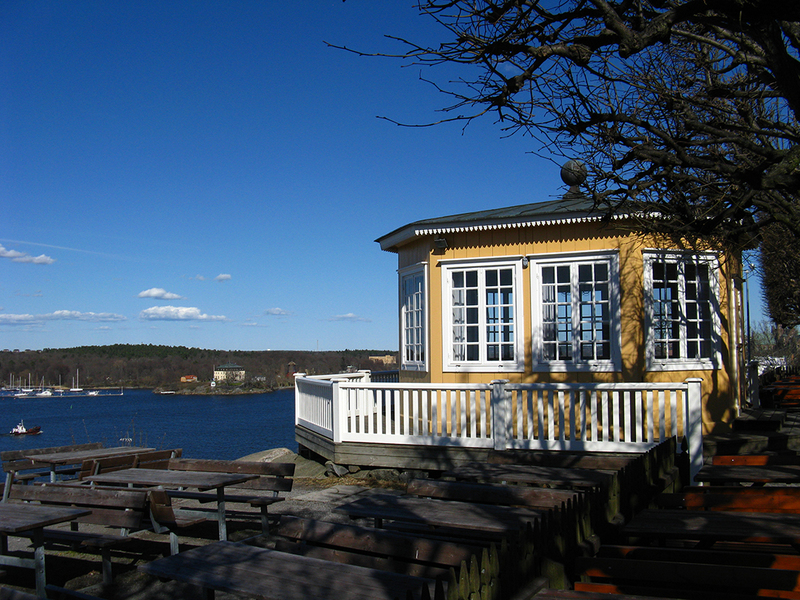 The malmgård now lies on the edge of an extensive public park and the building now houses a cafe and a private household. 16) Kristineberg's, 1750. Kungsholmen. 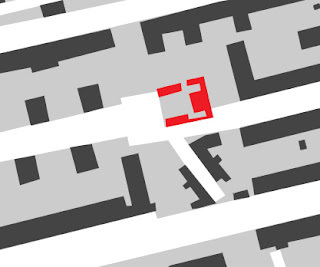 Architect: probably Carl Hårleman (son of Johan, see #3 and #10). Built by businessman Roland Schröder. 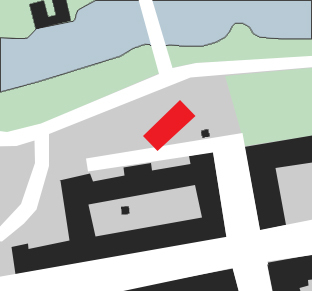 A farm occupied this site on western Kungsholmen from 1647, and we know that in 1717 the farm had both fields and unusually extensive livestock including horses, cows, sheep, geese, ducks, hens, and turkeys. The earliest buildings on the farm slowly decayed until 1748 when the new owner built a grand, two-story stone house. A double allée lead from the house all the way to Lake Mälaren as water was the easiest way to reach this far-flung malmgård. 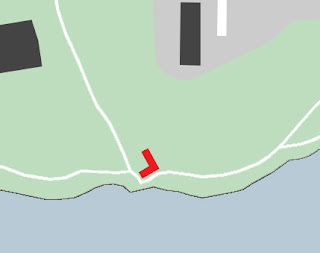 The allée was terminated by a dock. The beginning of this allée is still visible but it no longer continues all the way to the water. In addition to the grand house and allée, the new owner added a pleasure garden and a round pond. There was also an orangerie which allowed figs, peaches, and walnuts to grow. To support this massive household, the owner employed an indeterminate number of housemaids and wash maids, two gardeners, two serving maids, many farmhands, and a milkmaid. Together with two large wing additions, this building is now a school. The surrounding land is a large park. 17) Graver's, 1754. Kungsholmen. Architect: unknown. 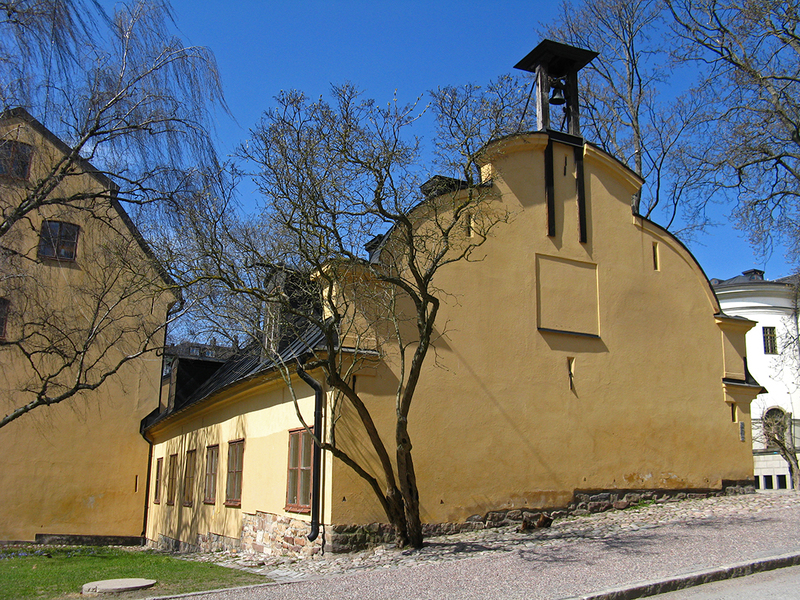 Built by a tanner and the tannery was nearby on the banks of Lake Mälaren. I haven't found that much information on these impressive buildings other than their construction date and the name and occupation of the owner. The huge, stone three-story main house is flanked by two long wings, one of which has a remarkable baroque gable. Interestingly, despite the size and grandeur of the complex, symmetry was obviously not of utmost importance as the front door is not centrally placed on the front facade and the wings are of unequal heights and lengths. Today the complex houses the Stockholm County Council. A preschool also occupies part of the park. 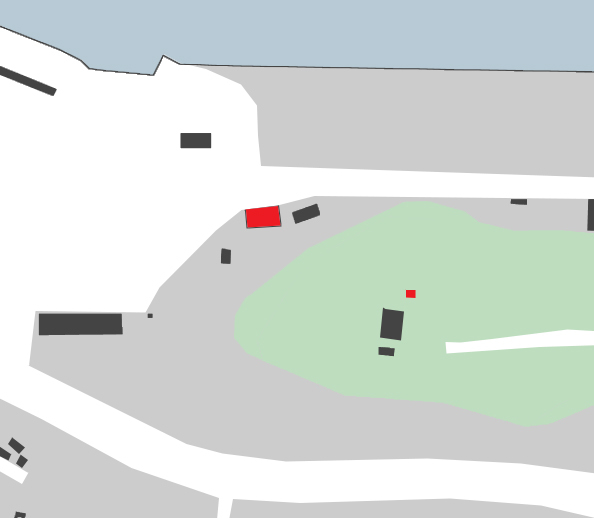 However, most of the green space is open to the public during the day. There are several old side-buildings on the property in addition to the main house and wings. I am not sure if they were part of the tannery or a part of the household. Or perhaps they were farm buildings. 18) Pasch's/Bellvue, 1755. Norrmalm. Architect of the 1755 stone house: Jean Eric Rehn. Architect of the 1780's wood house: Erik Palmstedt. Builder of the 1755 stone house: court painter Johan Pasch. 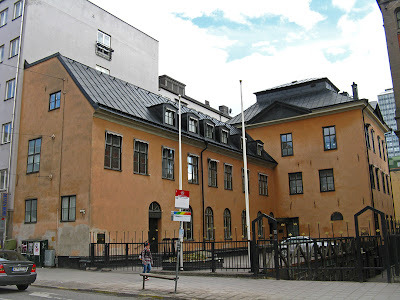 Builder of the 1780's wood house: Carl Sparre, Stockholm's Governor. While this area had been a farm for at least 50 years, it wasn't until 1755 that the owner built a small summer residence. Both the owner, Pasch, and the architect, Rehn, worked under Nicodemus Tessin the Younger and participated in the decoration of the interior of the new Stockholm Palace. Queen Ulrika was so delighted by their work in the palace that she rewarded them with a trip to Italy where they witnessed the new rococo fad. Apparently, Pasch's interior paintings were inspired by Bernini, but these were unfortunately destroyed. Further rococo inspiration was also translated into the pleasure garden and a fountain which imitated the Trevi Fountain in Rome. Unfortunately these do not survive either. 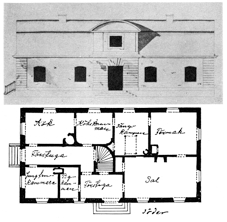 Rehn's drawing of the 1755 stone house. After some time, the property was bought by Carl Sparre. 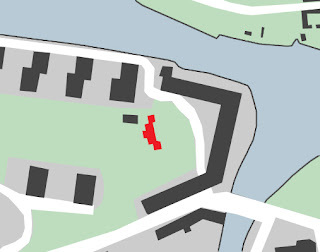 Used to the spacious, sumptions surroundings at the Tessinska Palace (see #20, Palaces of the 1600's), Sparre found the stone summer house too cramped. He hired Erik Palmstedt to build a larger, albeit wood, house. Left: This view to the malmgård from a nearby high hill shows how close the water at Brunnsviken is to the property. Right: the surviving allée leads toward downtown Stockholm. 19) Björn's, 1766. Södermalm. Architect: unknown. Built by a garden master by the name of Kristian Osthoff. This stone house was originally only one story, but a second story was added in 1817. The surrounding terraced vegetable and flower gardens survived until 1915 when the owner died and left the house and estate to the city. A day care center now occupies the house, and the garden is now a public park and playground. Like some of the other malmgårdar, grandeur was never the goal of this building. The oddly placed and asymmetrical window and door openings attest to the building's modest architectural ambitions. 20) Hartwig's, 1769. Södermalm. Architect: unknown. Built by Margareta Kierman who was the widow of an iron merchant. It is hard to really see the front of this stone building without climbing into the schoolyard, but the U-shaped nature of the building is obvious from the street. Also obvious is the asymmetrical, irregularly placed windows and doors. This building has been part of a a school complex since 1854. 21) Paton's, 1770’s. Södermalm. Architect: unknown. Built by Fredrik Lundin, a wholesaler. 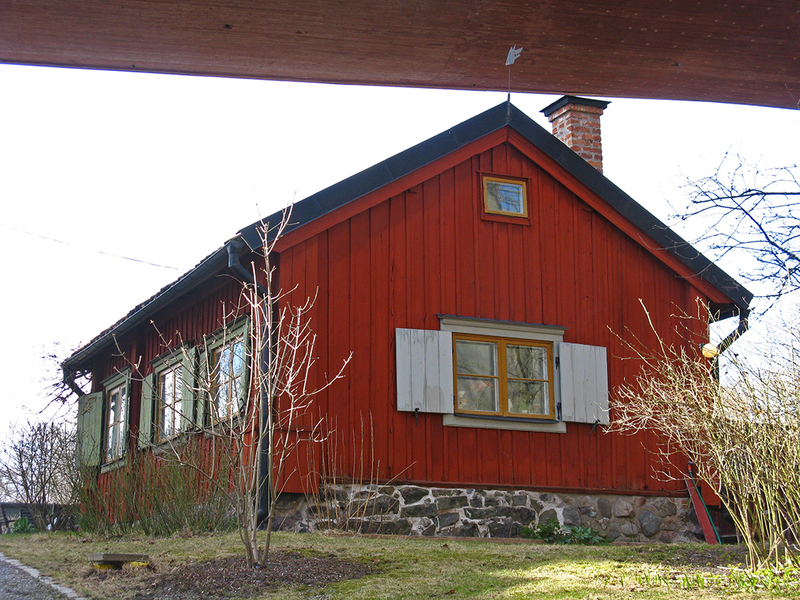 This stone house lies between the Stockholm harbor and the base of a very high, stony hill. In fact, the house lies in the base of the hill--the topography allows the back, water side to be four stories tall while the entry side facing the hill and the city is only two stories tall. A low, clumsy colonnade frames the two front doors (strange that there are two!) and provides a balcony at the upper level. While the entry facade is simple and symmetrical, the water facade has irregular window openings. High above the house at the top of the hill is a glassed-in pleasure gazebo for dining and entertaining. This gazebo is now part of a hilltop restaurant while the house is now office space for the adjacent ferry terminal. 22) Hellsten's/Wirwach's, 1770. 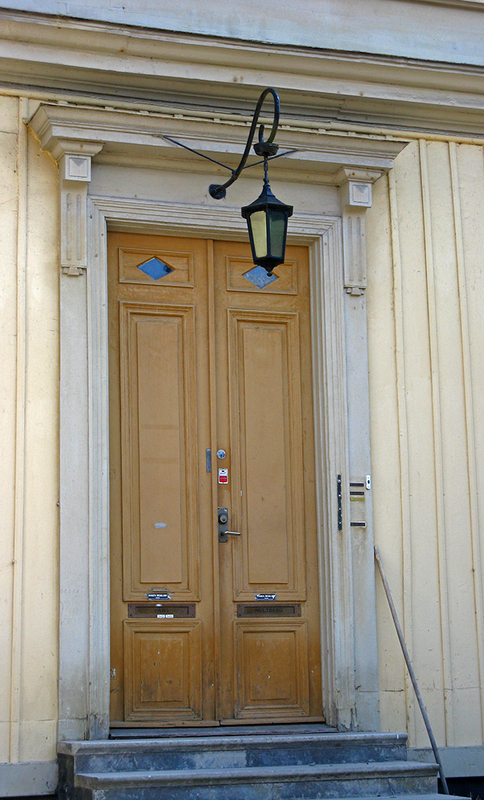 Södermalm. Architect: Johan Wilhelm Elies. Built by two families who jointly owned the land: the Wirwachs and the Senckpiehls were partners in an apothecary. While the main, central building is original, the two wings were built in 1825 and replaced the original wings which housed livestock. 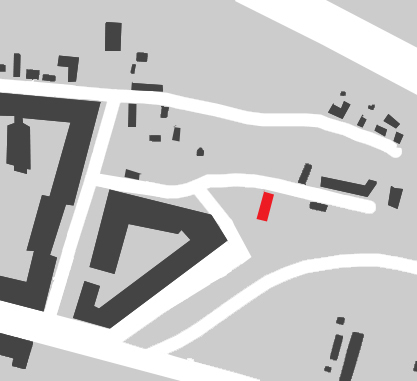 Housing livestock in farmhouse wings was very unusual (they were usually housed in outbuildings a good distance away from the main residence) and eventually this unconventional arrangement was changed. There was originally an allée leading toward town, but this is no longer surviving. Presumably, the farm provided the apothecary business with raw ingredients. Today these grand buildings house a hotel and event spaces. 23) Hoving's, 1770. Södermalm. 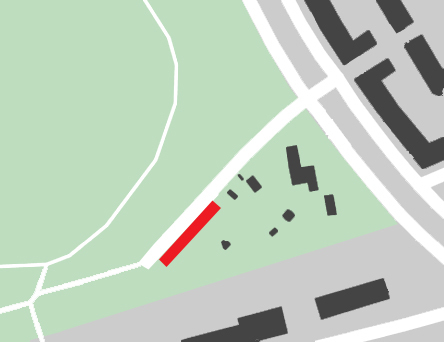 Architect: Casper Christian Friese. Built by Carl Gustav Hoving who was a dyer. Hoving was one of several dyers who had industrial workshops on the banks of Danviken. These industrial buildings no longer exist, but Hoving's impressive main house remains. Both facades feature a central tower mass with door as well as quoining, keystones, and a watertable. This is the only house that seems to address both the water and the city through the use of two front doors and two front facades. 24) Lilla Blecktornet, 1781. Södermalm. Architect: J W Elies. Built by Niklas Sjöberg who was in the textile business. When a sulfuric spring was discovered on this site in 1682, Doctor Haraeus founded a health resort. Due to the quantity of sulfuric water that one was required to drink, the spa was never a success. Eventually the property fell into the hands of the owner of a calico-printer who built a main residence. However, this residence was replaced by a new main building when Sjöberg took over. 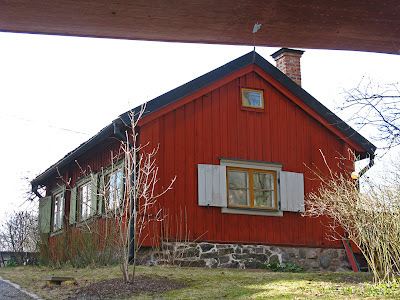 This malmgård is fairly typical of the late 1700's as it simultaneously accommodated farming, gardening, and an industrial function and included many associated buildings. 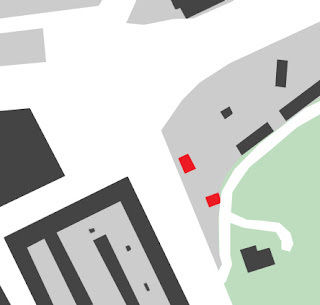 Other than the main residence, the other buildings have since been demolished. The allée leading toward town is also gone. Today the building is used as an office. It sits at the edge of a public park. 25) Kristinahov's, 1790. Södermalm. Architect: Petrus Serén. Built by wholesaler Georg Fredrik Diedrichsson. The main house, front and back. A farm and malmgård occupied this property at least since 1702, but the house and wings were torn down and re-built in 1790 by Serén for Diedrichsson. Much of the original interior survives. While the buildings are not overwhelming in scale, they are made of stone and the courtyard composition as well as terraced gardens lend the property a more stately atmosphere. Nearby the house and wings, there was an orangerie, terraced gardens, an icehouse, a gatehouse, and a wooden deck. Farm functions also included an outhouse, a barn with three horse stalls, a horse-tack house, a barn for four cows, a wagon garage, and several work sheds. Two wings form a "U" around the central courtyard. Today, only the main buildings and wings survive; they are used as event spaces, a cafe, and a boutique. 26) Reimers, 1794. Reimersholm. Architect: unknown. 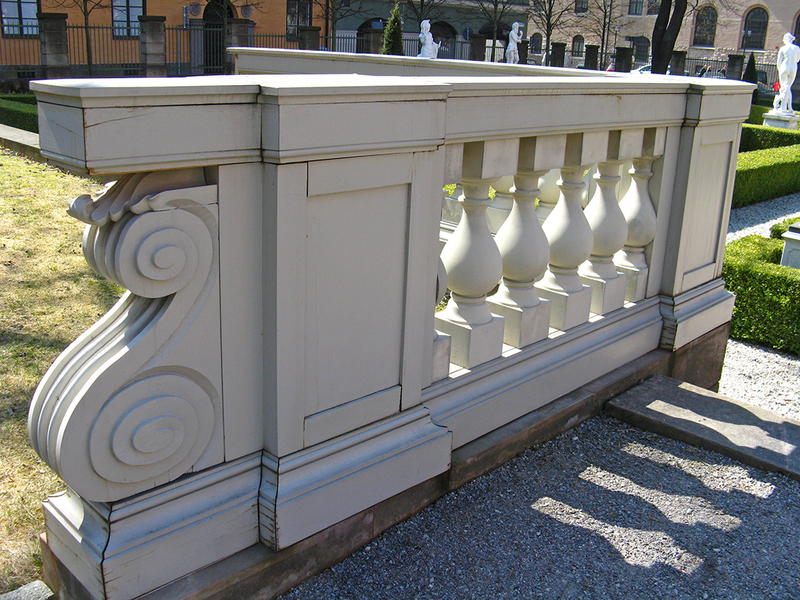 Built by Anders Reimes, a councillor, parlaimentarian, leader of, director for, and member of just about every public institution in Stockholm. He was also a wholesaler. The original 1794 house was a wooden one story building with a colonnaded entry and two wings. An allée lead from the back of the house to the water. Farm buildings included a barn for six cows, a horse barn, a duck house, a hen house, and an outhouse. A garden with a greenhouse was planted south of the house while a newly fashionable English garden was arranged west of the house. In order to create the English garden, bedrock was dynamited and removed, beaches were filled in, terraces were built, and 270 different kinds of plants were transplanted. Eventually the main building was expanded to a second story. Today it houses a daycare and a public park surrounds the house. 27) Rålambshov, 1801. Kungsholmen. Architect: Carl Christoffer Gjörwell. Built by Pehr Evert Georgii who was the Governor of Stockholm. While this property saw a long history of various types of farming, the buildings had all burned down by the time Georgii bought the property. 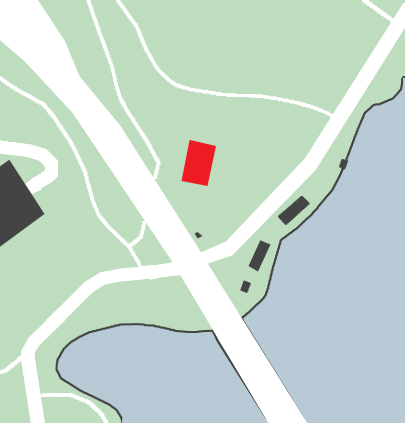 He hired Gjörwell to design and build a house, and Gjörwell decided to place it upon the highest point with the best view over the water to downtown Stockholm. The house is now a private residence, and it is surrounded by parkland. If the roads on my maps suddenly look much wider than before, that is because I have changed my method slightly. Before, I colored in only the actually road surface area white, but I have now begun to include the sidewalk area as well. I believe that this gives a truer sense of the urban landscape. All maps are the same scale, and north is up in all of them. All images and maps are my own unless otherwise noted. I am a friend of your mother's from Ypsilanti, Michigan, and I just want to tell you how much I enjoy this blog. Your posts are so detailed and thoughtful they read like essays. As a fellow photographer, I love the illustrations, too. And as someone of Swedish decent, I am extremely interested by your stories about daily life.